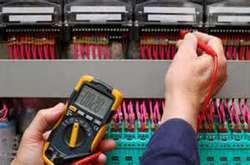 Counted among the topmost companies, we offer Electrical Safety Inspection Auditor service. The offered service is rendered by our trained electrical engineers and professionals who hold immense years of experience in engineering work. Through this service, we provide inspection work of electronic items in various industries. Infrared Thermography is ideal for carrying out Electrical Safety Inspections, be it to find that loose connection or a potentially overloaded component in your main electrical panel.